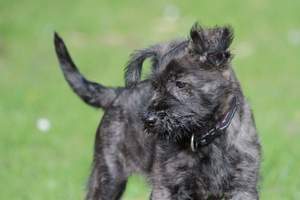 The Picardy Sheepdog is also known as the Berger Picard and Picardy Shepherd. It is one of the oldest French herding breeds and dates back to 800AD. After the two World Wars numbers declined rapidly and it is still still a rare breed now, although not endangered. They were bred as herding dogs, used to drive and herd sheep across France and Belgium. 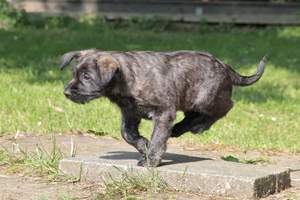 The exact origin is unknown, but many believe it is related to the Briard, Beauceron or Belgian Shepherd breeds. The Picardy is a loyal companion and will want to be by your side in all weathers. They are good with their family, other dogs, pets and children, but MUST be socialised properly from a young age. They can be territorial is they have little experience of strangers and therefore should be taken to puppy classes, meet new people outside and have lots of visitors when they are puppies. They tend not to chase small animals but could sometimes try to herd small children as is common with herding breeds. They are quick to learn and intelligent, so need firm and consistent training to get the best out of them. Positive reinforcement works well and they will soon pick things up. Consistency with training is the key to making sure the Picardy is a kind mannered, well rounded dog. They can be sensitive to harsh words and rough treatment, so a gentle touch and lots of praise will ensure that they understand what you are asking of them. They have a need to do something and are hard working, so agility competitions or obedience would suit the breed. Being so close to their owners can have it's disadvantages; they can suffer separation anxiety, so you should leave them alone for short periods from day one. They are notoriously picky eaters, so it may take some time until you both come up with a food that they like. Picardys are active and like to run. Their recall is usually good and they can be allowed off lead to run around if you are confident with them coming back. They usually do. If well socialised they will play with other dogs and like to bound around and run in circles, trying to herd the other dog. 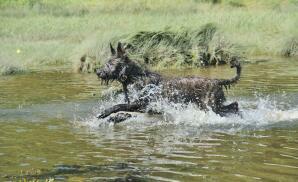 They are happiest when included in family life and don't do well in kennels. They need people around them to thrive and will want to sit close to you on the sofa after a long walk. Their coat looks after itself. It is rough and low odour, so you will rarely need to bath them. They need a brush every few weeks to get loose hair out, but they shed surprisingly little. A thorough brush when they are moulting is advised. Health wise, they can suffer from Canine Hip Dysplasia, but not being a heavy breed, this is quite rare. Eye related issues such as Progressive Retinal Atrophy are also seen, but due to the small number of animals and lack of inter breeding, they are healthy breed. Picardy Sheepdogs have a sensitive and companionable temperament. They make good family dogs who will want to be integrated fully into family life. They are good with children and other pets - especially if raised with other pets from puppyhood. It is important that training is consistent and delivered with authority or the Picardy may deem you a pushover. Socialise them with strangers and other dogs as early as possible to help them grow into well rounded individuals. Health problems that may affect Picardy Sheepdogs include canine hip dysplasia (CHD), progressive retinal atrophy (PRA: degeneration of the retina which can lead to blindness) and other eye problems.